As such a beautiful neighborhood, it’s easy to forget that Candler Park is also a park! Featuring a swimming pool, football & soccer field, basketball and tennis courts and a playground for kids, Candler Park has something for everyone to enjoy. Actually, one of neatest things about this park has nothing to do with the park itself – it’s about the layout. Candler Park connects on the west side to the Freedom Park Trail, which in turn connects to Freedom Park! Freedom Park stretches like a “t” in all directions, providing multi-use bike/walking paths that extend into several other neighborhoods such as Virginia Highlands, Inman Park, Old Fourth Ward, and Poncey Highlands. Even in the cold, Atlantans take advantage of these great paths, and can be seen running, biking, and skateboarding throughout the day. 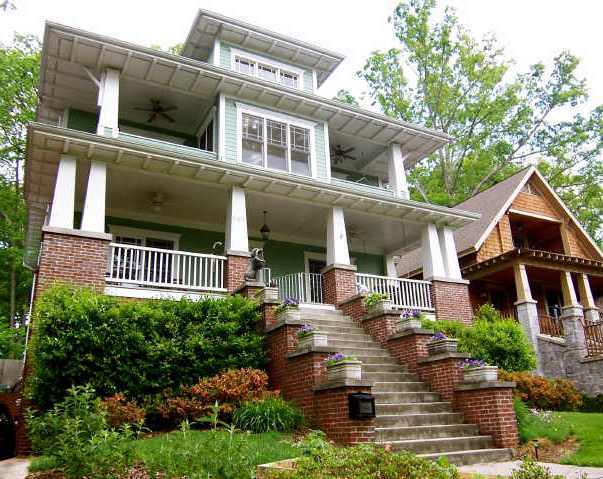 Candler Park also boasts a 9-hole golf course, which is flanked on the east side by gorgeous craftsman style homes and on the north side by the Stone Mountain Trail (another multi-use bike/walking trail – have I mentioned how much I love this city!). If you make your way past the golf course and turn south on Clifton Rd, it won’t be long before you stumble upon Flying Biscuit, a market, and a couple of other shops. You’ll feel it’s a bit out of place in this lovely neighborhood featuring rows of bungalows, craftsman style homes, and Tudor homes, but that’s the point. This corner of yummy food and fun is a place of local pride for the folks that live there. Ask anyone that lives in Candler Park where the neighborhood is located, and the first thing they’ll say is it’s next to the Flying Biscuit (which often isn’t all that helpful for visitors!). If you’re not in the mood for omelettes and bacon, continue west down McLendon for about a mile and behold Little Five Points! Fun! In fact, that’s one of the best parts of Candler Park – walk a mile in nearly any direction and you’re sure to have stumbled into something exciting. Go ahead – try!